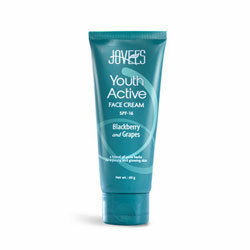 Buy Jovees Youth Active Face Cream SPF 16 Blackberry and Grapes Pure Herbs for a Young, Softness and Glowing Skin. Reduce fine lines, resist melanin production. A light weight cream, easily absorbed into the skin helps to plump up the collagen in the skin, reduce the fine lines, resist the production of melanin and brings glow and softness to the skin. This youth active face cream, full of organic ingredients, boosts the skin's natural cellular renewal, which makes skin appear more lifted and firm. In addition, it gives requisite hydration to skin and protects skin from harmful effects of sun rays. Cleanse face and pat dry. Apply all over face and neck and leave on.